Stonewall Gazette: WATCH: Official Trailer for "Raid of the Rainbow Lounge"
WATCH: Official Trailer for "Raid of the Rainbow Lounge"
"In the days after the controversial Rainbow Lounge raid in Fort Worth last June, LGBT activists and their allies took to the streets of Dallas, Fort Worth and beyond. But unbeknownst to filmmaker Robert Camina, he was about to embark on a year-long journey that would result in his first full-length film-and first documentary," writes Michelle Parsons. "The San Antonio native wasn’t ready for how the incident affected him. He quickly learned, however, even in a conservative town that is more akin to cattle roping than equal rights for gays, change is possible. 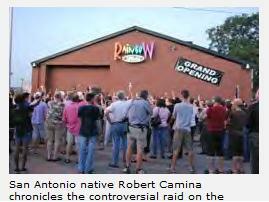 Camina chronicles the controversial raid on the Rainbow Lounge in Fort Worth and subsequent fallout in his first documentary that is slated for release in November." Filmmaker Robert Camina talked with EDGE about how the raid impacted him and how he hopes his documentary will impact those who watch it. Read the full interview here. Please visit www.caminaentertainment.com for more information. What happens when on the 40th anniversary of the Stonewall Rebellion, the police and officers from the Texas Alcoholic Beverage Commission, raid a Fort Worth, Texas gay bar, resulting in multiple customer arrests and hospitalized patrons? RAID OF THE RAINBOW LOUNGE is a 103 minute documentary recounting the widely publicized and controversial 2009 police raid of a Fort Worth, Texas gay bar that resulted in multiple arrests and serious injuries. Following sordid allegations and outrage, many changes occurred in the city, and Fort Worth became a leader in LGBT equality. However, the changes did not happen overnight and without controversy. The audience will witness history unfold as this film documents that journey from the perspective of witnesses, activists and politicians who helped changed the city.